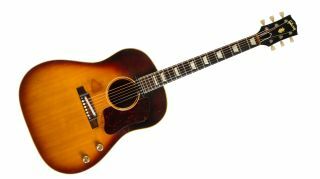 Lost for over 50 years, John Lennon's Gibson J-160E has sold for an unprecedented $2.41 million (£1.6 million), making it the second most expensive guitar ever sold at auction. Bought from Rushworth's Music House in Liverpool for £161, the acoustic guitar went missing in December 1963, but was recently discovered and verified by Andy Babiuk, author of Beatles Gear - All The Fab Four's Instruments From Stage To Studio. During its time with Lennon, the J-160E was played on recordings of Love Me Do, Please Please Me and From Me To You, while it was also a songwriting favourite of Lennon's, and he used it to write hits including She Loves You, I Want To Hold Your Hand and All My Loving. The guitar, which was sold by Julien's Auctions to an anonymous buyer on 7 November, is second only to the Reach Out To Asia charity Stratocaster, which went for $2.7 million (then £1.6 million), and was signed by the likes of Bryan Adams, Mick Jagger, Keith Richards, Eric Clapton, Paul McCartney, Jimmy Page and Brian May. Although originally expected to reach between $600,000 and $800,000, Lennon's Gibson is now comfortably ahead of other fabled instruments sold at auction, such as Bob Dylan's Newport Strat ($965,000) and Eric Clapton's 'Blackie' Strat ($959,000).